This guide is designed to assist you when processing periods of maternity leave for your employees. 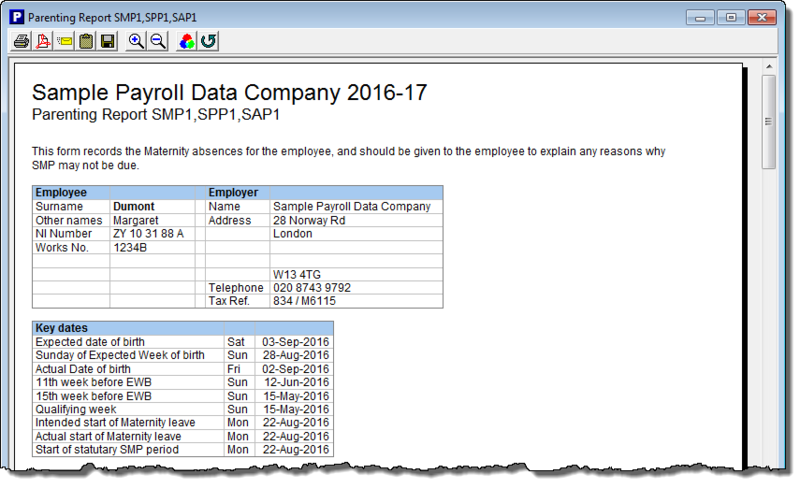 There is also an accompanying video at the end of this guide which shows how to enter SMP into Payroll Manager. SMP is paid to an employee by their employer, it is payable for up to 39 weeks, although the employee is entitled to a maximum of 52 weeks leave. 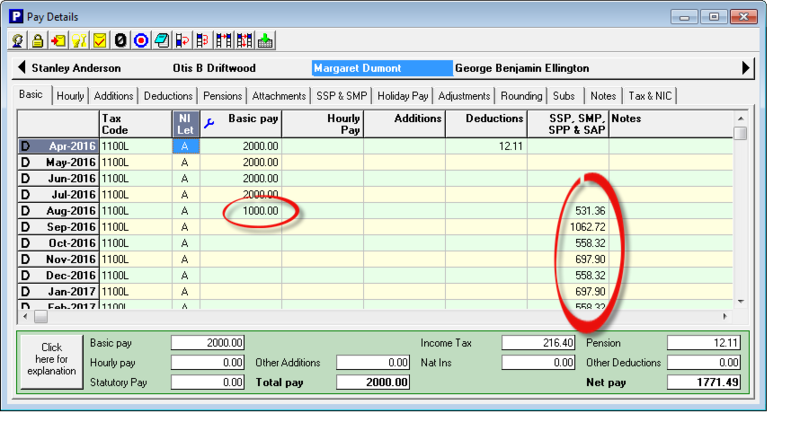 Payroll Manager will automatically calculate if an employee is entitled to SMP – this is based on how long they have worked for the employer and how much they are paid. As a rough guide their average weekly pay should be above £118 (for 2019-20) and they should have worked for you 26 weeks prior to the qualifying week (the qualifying week is 15 weeks prior to the expected date of birth). SMP is payable at 90% of the employee’s average weekly pay for 6 weeks and then at a rate of £148.68 (for 2019-20) or 90% of the average weekly wage whichever is lower. Your employee should inform you of the date they wish their leave to begin and how many weeks of maternity leave that they intend to take. 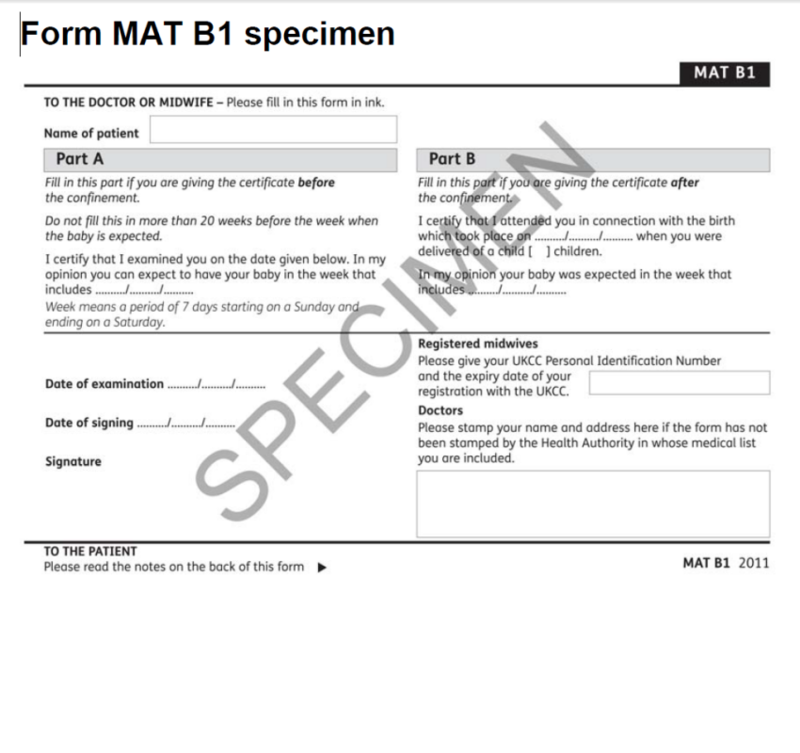 They should also provide you with medical evidence of their pregnancy, this would normally take the form of a MAT B1 form (typically issued around the 20th week of pregnancy). You will also need to enter the ‘number of weeks leave’ the employee intends to take (typically 39). If SMP is due, the calendar will show a series of symbols for the applicable dates. If no SMP is due, or if the pay period falls outside of the current tax year, the symbol is displayed. Click on the ‘Reports’ button on the calendar screen and then select ‘Parenting’. This reports shows the keys dates used in the calculation of SMP and how much the employee will receive. If your employee is not entitled to maternity pay this report will explain why, and the report itself can be given to the employee as an explanation. The report also shows how the average weekly pay is calculated and the employee’s entitlement for each pay period. SMP is a weekly entitlement. For employees paid on a monthly basis Payroll Manager allocates each complete week of SMP into the relevant month. Once SMP has been entered onto the calendar the amounts payable will be shown on the ‘Pay Details’ screen. 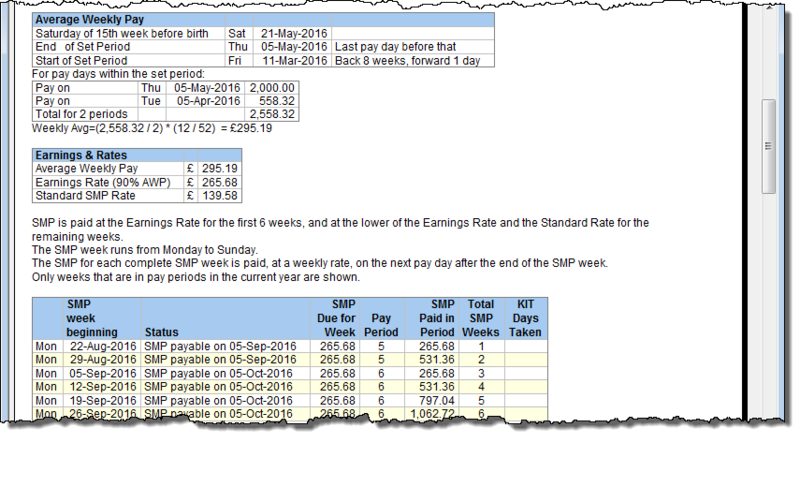 You may need to amend the basic or hourly pay as by default the SMP is added to the payslip. Some companies just choose to pay the statutory amount of SMP, whereas some will continue to pay a salary as normal. This will depend on the company policy and contract with the employee. Any SMP recovery / compensation due in a tax month reduces your NIC liability to HMRC for that period – Payroll Manager calculates the appropriate amounts automatically. SMP payments made to the employee are reported via the Full Payment Submission (FPS) for the appropriate period, and can be viewed by selecting the ‘Statutory Pay’ layout on the FPS report. 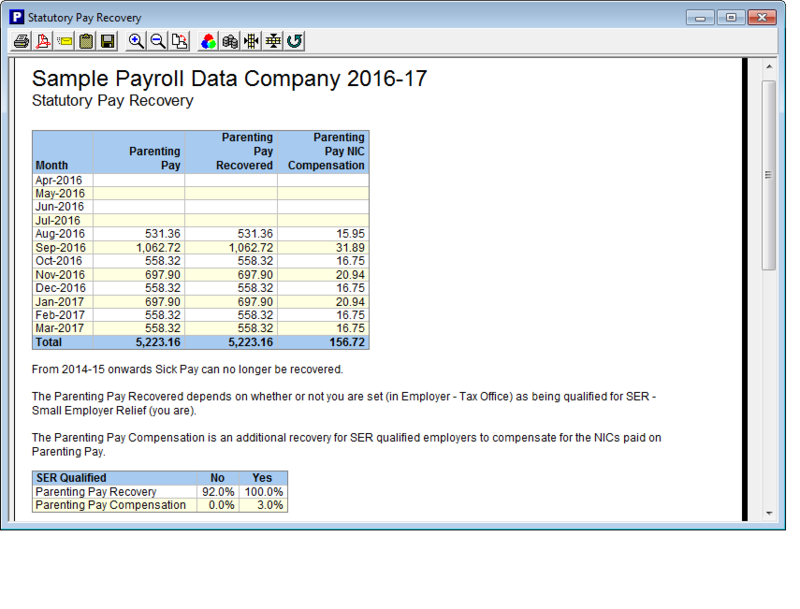 SMP recovery and compensation is reported on a monthly basis to HMRC via the Employer Payment Summary (EPS). If the employee is a member of a workplace pension scheme then special rules apply which mean that the employer should still pay pension contributions based on the employees pensionable earnings before their maternity leave. 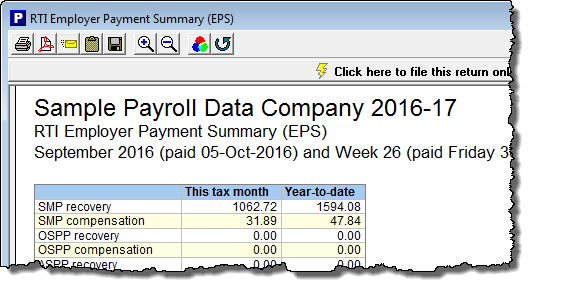 Payroll Manager is not able to do this automatically, and the employer pension contributions should be manually entered on the Pay Details screen during this period. Please see our guide to Workplace pension scheme contributions during periods of parental leave for details of how to do this. The Pensions Advisory Service website offers further information. How is the average weekly pay calculated? – As a rough guide the average weekly pay is calculated over a period of 8 weeks. The 8 week period is taken just before the qualifying week (the qualifying week is 15 weeks prior to the expected date of birth). 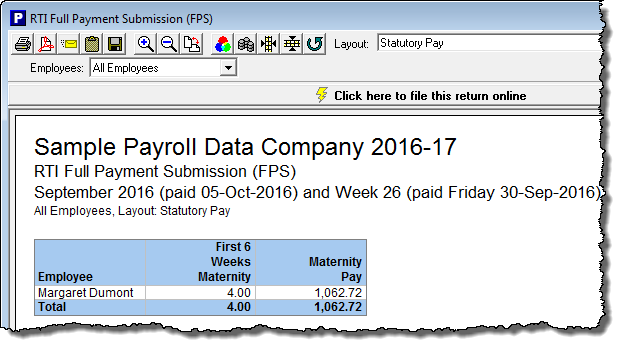 In some cases (if there is not enough payment history in Payroll Manager) you will need to calculate the average weekly pay* and enter it into the ‘Over-riding Average Weekly pay’ box on the ‘Calendar – Settings’ screen. What happens if the employee has a pay rise after the 15th week before the baby is due but before the expected week of confinement? – In circumstances such as this you will need to manually calculate the Average Weekly pay and enter the correct figure in the ‘Over-riding weekly pay’ box. What happens if the employee comes back to work early? – If the employee wants to return to work early you will need to remove the maternity pay from the calendar. To do this set the day they return back to a normal day by clicking on the button. 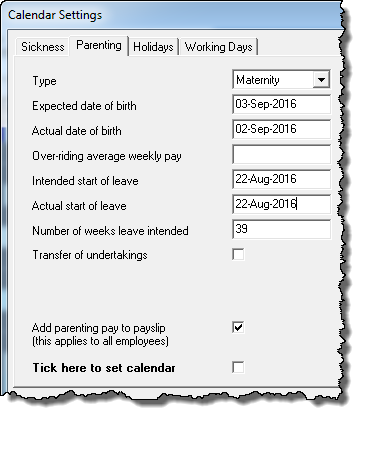 Click back on the normal day and drag the mouse to select the remainder of their maternity leave and set it back to a normal working day. You should bear in mind that maternity pay is only payable on complete weeks so care should be taken to make sure that the employee does not lose any of their entitlement. What are KIT days? – Your employee is allowed to work for up to ten days during their maternity leave without it affecting their maternity pay. These are called ‘Keeping in Touch Days’. Both the employee and employer must agree whether ‘Keeping in Touch Days’ will be worked, how many they will work, when they will work them and how much they will be paid for them. The employee is under no obligation to work them and the employer is under no obligation to offer them to the employee. To set a KIT day in Payroll Manager, from the calendar screen select the day the employee is to work and then click on the icon. An employee can take up to a total of 10 KIT days. *for more details on how to calculate the Average Weekly Pay, and for further guidance on SMP please see ‘HMRC Employer Helpbook for Statutory Maternity Pay E15’. This video shows how to record maternal leave and calculate SMP.